Great look at the Tedorigawa brewery which still makes sake the old fashioned way- by hand. This involves the brewers spending six months at the brewery- October through April and monitoring the process and going with their intuition. When you see the film you have to give yourself over to it. Structured so that we see and more importantly feel the rhythms of the brewing process the film can seem daunting. The film first has long takes of the men going through their routines. We watch as the rice is boiled and rolled by hand, we sit with the men as they eat and check the fermenting mixes all day and night. All along the way the mixes are tasted and adjusted not according to formula and intuition. The pace is a tad slow as we get to see and understand what they are doing. We also slowly find a place among the men as they become more than just random faces but people we like. Once we are set in the cycle of the days the film picks up speed as we move through time faster and we branch out into looking at how taste is selected, how the sake is sold and what the guys do when they have a rare day off. You really get a sense of what it takes to do the brewing by hand. The film is easily one of the most beautiful films at Tribeca. While the film is largely straight forward reporting of events there are times when the film transcends the routine and turns the act of working into a glorious ballet of image and sound. Sometimes it’s in artistic sequence but more often than not its simply in managing to pick the right angle at the right moment to reveal the beauty in the everyday. 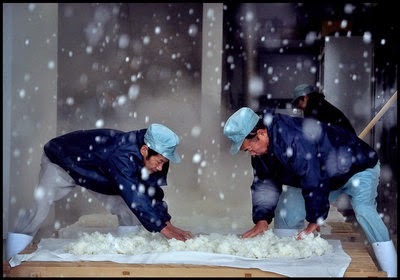 I know there is a long tradition in Japan of finding the magic in the everyday with something like the tea ceremony or pruning a bonsai tree, but here in the creation of sake, we see that notion not in a ceremony but in the every day. It’s magical and shows us just how glorious life really is. I love this film a great deal, but I’m having a hard time explaining the film. This is one of those films I can tell you how good it is, but I can’t adequately explain the film without it seeming like something it’s not. I can say it’s deliberately paced and a mediation but that will make it sound stogie. The opposite is actually true it’s very much alive. It’s like a quiet afternoon with friends instead of a morning in church. The film is so alive and so affecting that when something happens toward the end of the film the entire audience gasped. I could hear people reacting around me. It got to people. This is a great little film and if you’re willing to go with it you’ll be greatly rewarded.